Home » Buyers guide » The Best Affordable Toaster Ovens For College Students – Great Food On A Budget! The college and student life is tough. You’re short on time, money, and let’s face it – you can’t always eat well. Don’t worry though – I’ve got the answer! 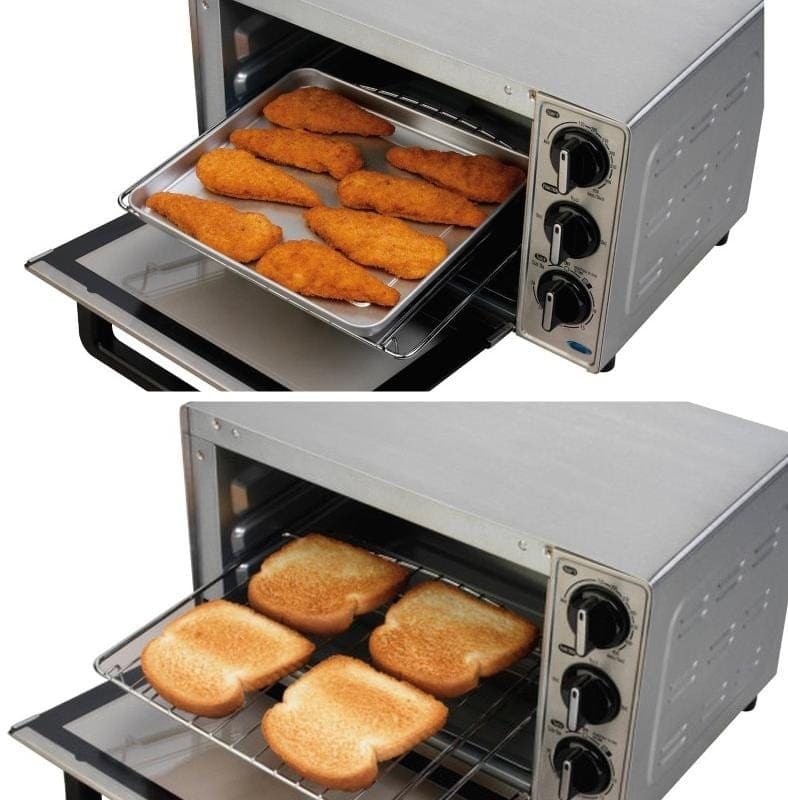 A great toaster oven can help you save time, money, and hassle…all while letting you cook some fantastic meals easily. I’ve put together a list of 4 of the best affordable toaster ovens for college students below. Each one’s a great choice and only $50 or less! Read on as there’s a ton of free & helpful information you can read before spending a penny. 2. How do toaster ovens work? 3. What kinds of foods can they cook? 6. How long does toasting bread take? Toaster ovens are a smaller version of conventional large ovens and use an oven rack for cooking just like they do. Unlike their larger counterparts, however, they’re much more efficient – not just in cost, but also by providing faster cooking and lower energy use. Despite being small, many offer some great convenience features. Don’t let the name fool you – “Toaster” ovens can do a lot more! A toaster oven is a small cooling appliance which uses electrical heating elements to cook food by heating air inside a sealed baking container. Most are small in size. For example, many have a general size around 12 to 15″ width x 12″ to 15″ tall (about 30.5-35 x 30.5-35 cm). The depth is often of a similar dimension, although the particular dimensions vary a lot based on the model and design. Most (but not all) of today’s popular toaster ovens are in fact convection ovens. Convection ovens are an enhanced version of traditional cooking ovens of the past. Convection cooking uses an electric fan to move the air around the food, providing better heat distribution which results in better results. This is especially important for foods like pizza or others with a crust which is better with an evenly toasted surface. Toaster ovens also may include features not found on larger home ovens, like specialty bread toaster features, toast timer presets, and more. They’re designed to give great convenience and ease-of-use that conventional ovens don’t offer. What’s especially great is how affordable they can be for students! 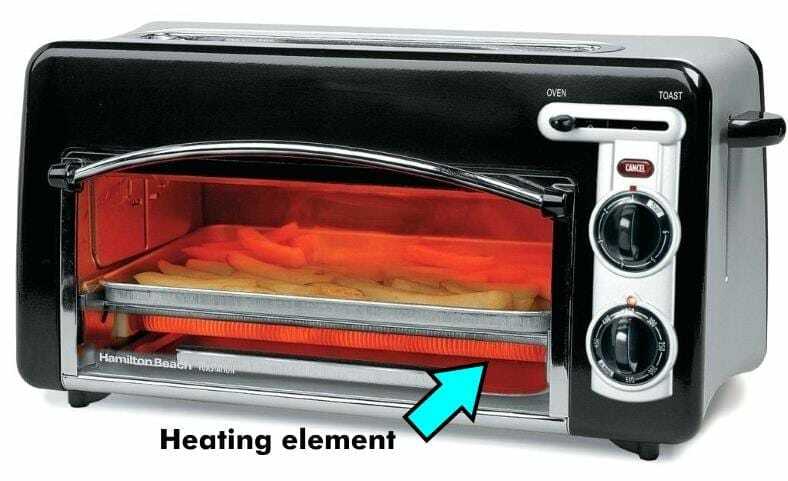 Image of a typical toaster oven baking french fries. Shown is the red glowing electric heater element which warms the air for cooking. The amount of cooking power (and cooking speed) of a toaster oven is based on its power rating and design. While the name “toaster oven” may imply that they’re ideally suited for bread, in fact that’s not true at all. They’re actually quite competent for many wonderful cooking tasks where a larger oven isn’t required. You’re nearly unlimited as far as what kinds of snacks or meals you can cook with one, in fact. As college budgets are often very strict (yes, I’ve been there, too!) it’s really up to you as far as how much you’d like to spend. However, as I’ll show you below, there are some excellent buys for about $50 and below. Are you a bagel or toast lover? Some models offer a unique feature: a traditional pop-up toaster on top of the cooking oven. For those who love toast but want it even faster, it’s a great way to get your tasty bread. While I’ve mentioned several of their uses above, there are some other features you should know about before shopping. They’re also unique to the particular model and design so it’s important to check before buying. Crumb or drip tray: Wonderful for cleanup. 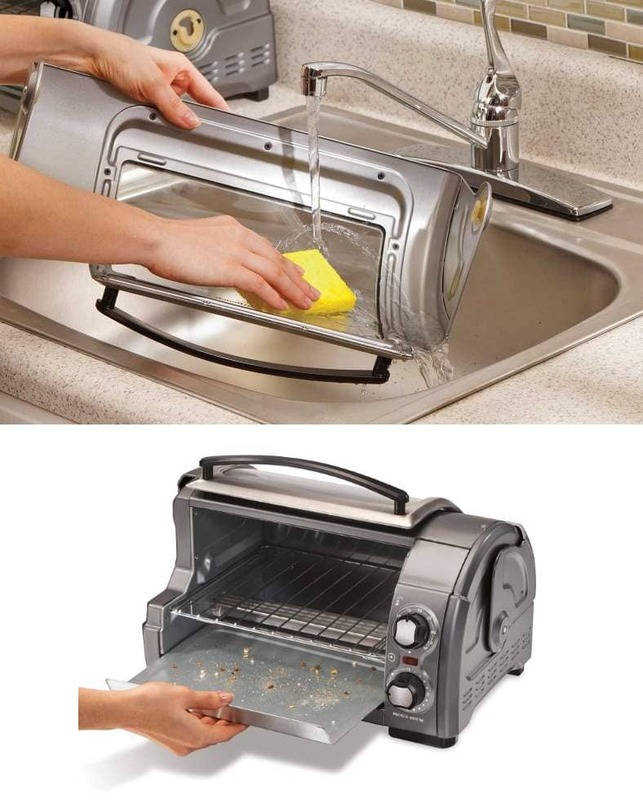 A removable tray or pan that catches fallen crumbs from toast or other foods as well as dripping oils or fat. Toast darkness setting/timer: Allows cooking perfect toast! Set the toast darkness level and/or timer and you’re done! Air fryer: Not common on budget models, this is a special cooking mode that somewhat replaces oil frying results with a healthier alternative. Great for french fries, chicken wings, and many traditionally fried foods. In order to keep costs down, most sold today use electro-mechanical components and rotary dials. 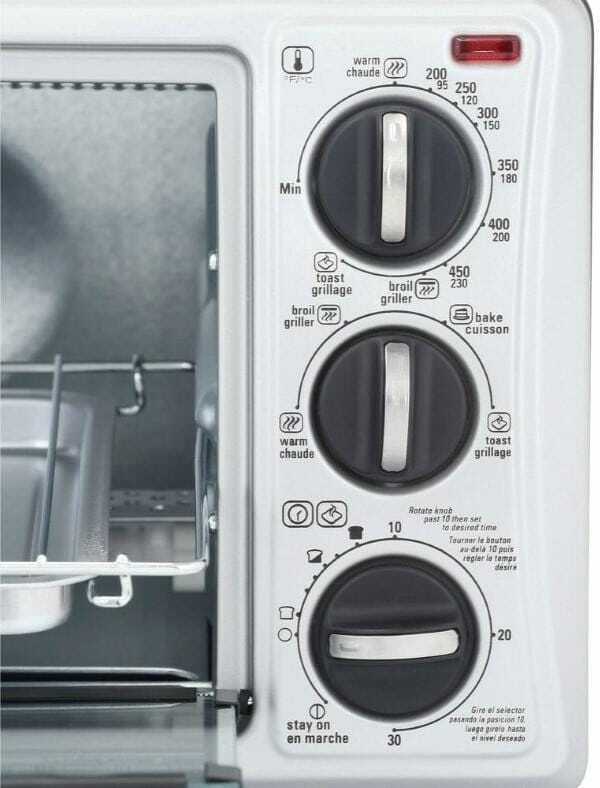 Some models, however, (normally more expensive units) have digital controls and a numeric display that shows cooking information. While I generally prefer digital controls, in my experience the standard dial controls work very well in quality models I’ve tested. What kinds of foods can they cook? Top: The best cheap frozen pizza I ever ate in my life! Perfect for college life! I tested a Cuisinart toaster oven for pizza and got fantastic results. Bottom: You’ve got lots of food options, including wonderful foods you’d normally pay for at a restaurant like chicken wings. This particular model, the Cuisinart TOA-60, features an air fryer cooking option. I love it! Possibly a better question to ask is, “What CAN’T you cook with a toaster oven?” They’re so versatile, it’s kind of hard to think of what that might be. Generally speaking, most limitations are the size of the oven vs how much food you’d like to prepare. 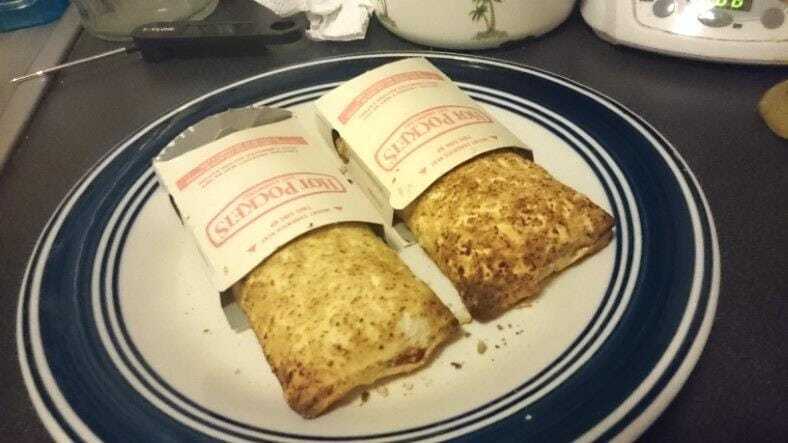 An excellent food for the college budget, Hot Pockets like these pizza-flavored ones I cooked come out of the oven hot, fresh, and crunchy. I was delighted by how delicious they were – FAR better than any I’ve had in the past from a microwave oven! The good news is that most products include an oven rack, crumb tray, and baking tray so you can get started right away without spending any more money. One drawback to these small appliances is that if you need more cooking pans it can be hard to find one that’s the right size. Many off-the-shelf cooking pans are designed to fit larger ovens, unfortunately. In a recent post answering the question, “How long does a toaster oven take to preheat?”, I set out to find out how much time you’d have to wait for cooking food. What I found was pretty interesting! My real-world test results to find out how long preheating typical toaster ovens would take. Left: A standard-sized Black and Decker oven. Right: A larger Cuisinart TOA-60. The results were pretty good! Compared to larger ovens which can take up to about 15 minutes, toaster ovens take up about 1/2 – or less – the same time. Nice! To do so, I used a digital thermometer and temp probe along with my stopwatch app. The results were pretty good, actually. In both cases, my toaster ovens took 1/2 half the time of a larger appliance. Based on my measurements, you can expect to wait about 5-6 minutes or so depending upon the model. Do I have to preheat my oven? While you don’t have to, I definitely recommend it except for a few situations. Preheating a toaster oven brings it up to a ready temperature so that the food will have a consistent cooking temperature from start to finish. When performing functions like using the warming setting to re-heat leftovers or keep food fresh and hot until you’re ready to eat, it’s not necessary. For most cooking tasks that need a relatively high temperature, however, it does make a difference. I know from personal experience how tough working, going to school, and just trying to find time get things done can be. It’s rough! The great news is that you can get some quality food in those brief moments in between studying and everything else. But how long does it take to cook many foods in a toaster oven? Real-world testing and facts are better than just guessing or Googling for someone’s opinion, so I dug in deeper. I measured cooking times for a variety of foods. 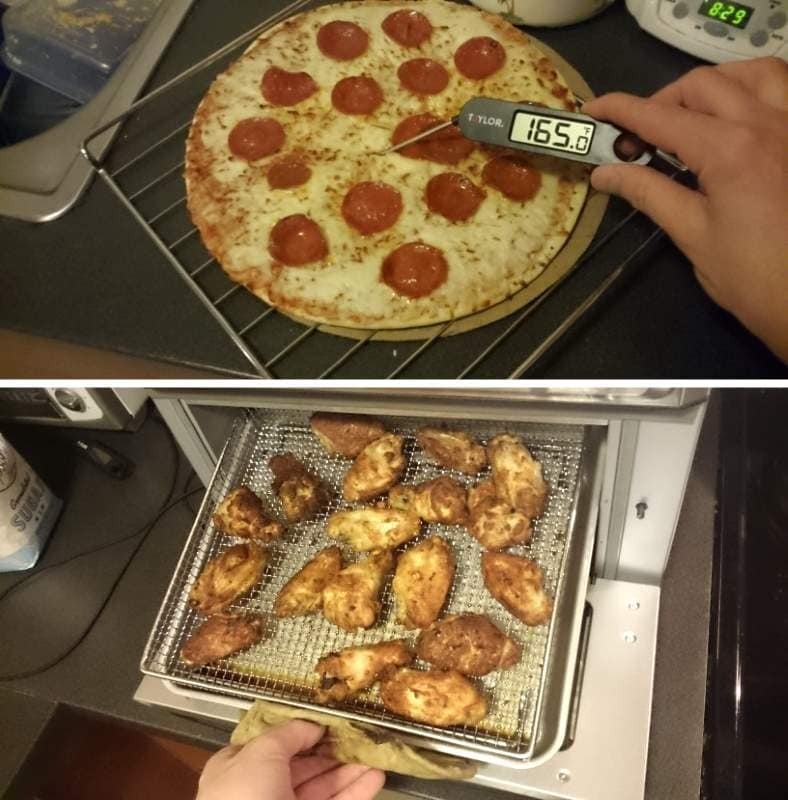 Image showing the toaster oven cooking time I measured for a typical budget college meal – a mini frozen pizza. I tested using my Cuisinart TOA-60. Note that cooking times will vary from oven to oven. In this case, convection baking made a big difference! It’s very important for me to clarify that I used the convection baking option in my test oven. In case you weren’t aware, you’ll more often get better results by using convection baking. That’s especially true for items with a thin crust or thin and/or flat like a pizza is. Generally speaking, the time required depends greatly on the oven size and power rating. Think of it this way: by the time it would take to have food delivered or even drive to a restaurant, you could already be eating a fresh meal cooked in your dorm or apartment. You’d also easily save 1/3- 1/2 the money, too! Testing average bread toasting times. Out came perfectly toasted medium-darkness white bread. Delicious! As they are called toaster ovens, after all, I thought I should put them to the test in that area as well. I love toast and think it’s great. But what I didn’t know is that my toaster ovens would produce the best toast I’ve ever eaten in my life. I’m not exaggerating when I say that! I measured toasting times for 4 slices of bread using my Cuisinart, on all 3 available darkness (toast timer) settings. Other ovens are somewhat similar, depending upon their design. Medium (my favorite) was fantastic! A perfect brown toast evenly placed across the bread. Wonderful! Similarly, other models will have about the same results. I’d estimate a difference of 1-3 minutes in some cases, but generally you should get about the same results. 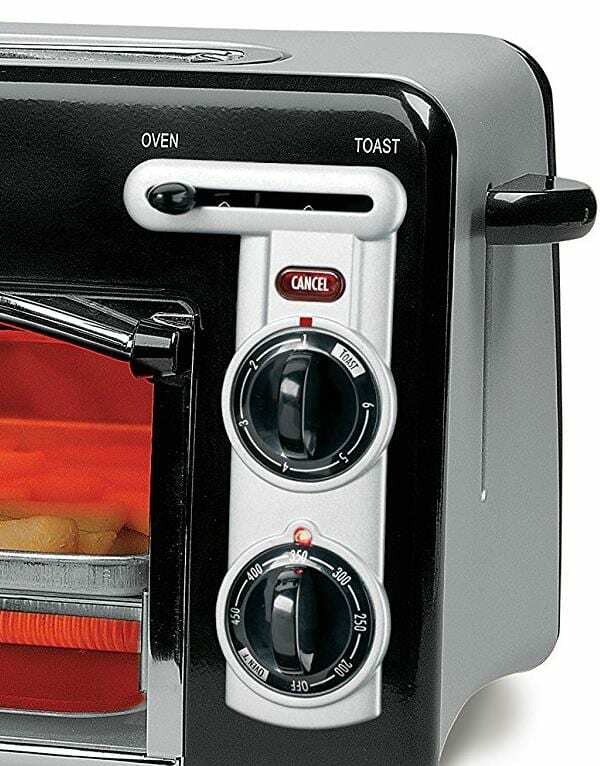 Ideally, look for a model that makes toasting easy by providing dial controls marked with toast darkness settings already. It makes it easier to use and you can also get consistent results that way. 1. Black and Decker 4-Slice Stainless Steel – Get great features, easy cooking, and fantastic food under $50! It seems like there are just so many options to choose from out there. However, I’ve come across one that’s a fantastic budget value not just because it’s affordable, but it offers so much. The Black and Decker 4-slice model TO1313SBD toaster oven is simply one of THE best values for today’s college student. While it’s budget-friendly, it doesn’t skimp on quality. There’s a very nice stainless steel finish, simple but well-designed control panel, all the basic features you need, and a front door that’s easy to open and use. Not only that, but it also features the company’s proprietary EvenToast design to produce toasted bread that’s 30% more evenly done than competing products. It’s one of the best choice when you want a well-rounded toaster oven but have a budget, too. The controls are user-friendly and simple but get the job done really well, in my opinion. You’ll get temperature presets, a cooking timer, and 4 main cooking modes that cover nearly all cooking tasks you have. There’s also a power light to show when the oven is and isn’t in operation. Although it’s one of the most affordable models sold today I’m impressed with the features (and performance, too). 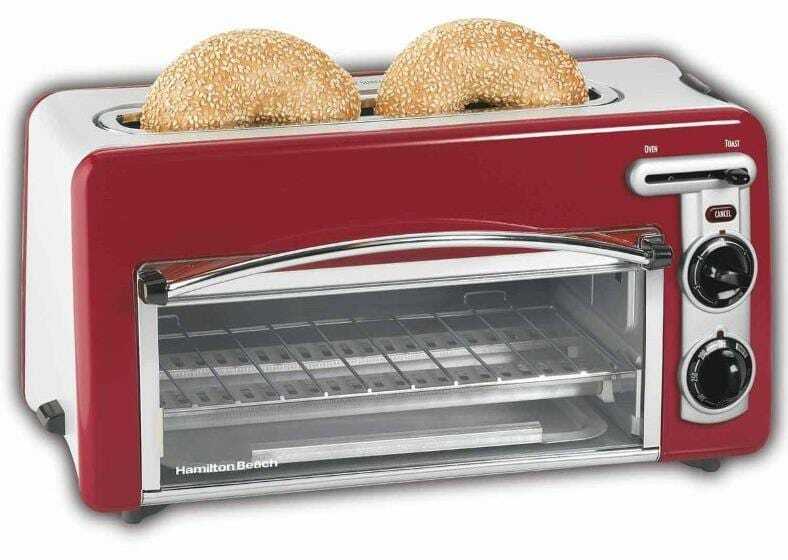 Bagels, bread, and so much more toast nearly perfectly thanks to the even heating in the Black and Decker – 30% better than leading competitors! 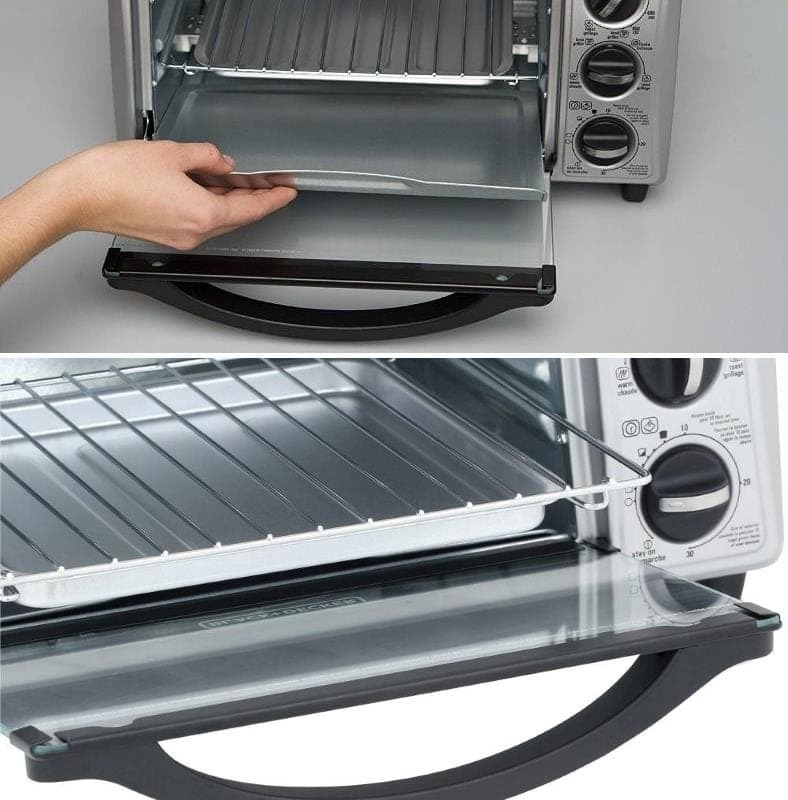 Fit up to 4 bagel or bread slices on the oven rack. The removable crumb tray (bottom) makes cleanup easy afterwards. Ready for some fantastic, fresh toast after a hard day of classes or working? You’ll get some of the best you’ve ever had, up to 4 slices at a time. Black and Decker’s EvenToast technology works to more evenly toast bread for better results. A cheap electric toaster can’t even come close! When you’re finished, just slide out the crumb tray found at the bottom for easy, hassle-free cleanup. I really like how well it works and how it keeps cleanup so simple. The crumb tray also works well to capture drips that may happen when cooking meats and other foods. Top: Cleanup is easy! Slide out the bottom crumb tray after cooking or toasting for easy access. Bottom: The oven rack also conveniently holds the baking pan/drip pan underneath. It slides out easily for use or for hand washing when needed. One thing I also really like is the nice front flip-down door. It’s well-designed, lets you see the oven interior easily, and prevents burns as the handle is heat-resistant. Measuring only 16.5 x 10″ in size, its small might fool into thinking it’s less capable. I’m happy to say that definitely not true! Yes, it is a small toaster oven, meaning that you can’t cook an enormous tray of chicken breast fillets, for example. However, it’s fantastic for those everyday college meals, snacks, and getting something hot and fresh ready for a get-together or study session. Overall, I’m pretty impressed with it despite the low price (often well under $50 if you shop smart). I also like how it heats up quickly. However, it’s not perfect of course, and I do have a few minor complaints. The outside of the oven gets pretty hot during cooking. Also the baking/broiling tray that’s included isn’t was wide as it could be (it’s a bit shorter than the inside width of the oven). Honestly, though, that definitely doesn’t detract from what’s a great value and a great buy. 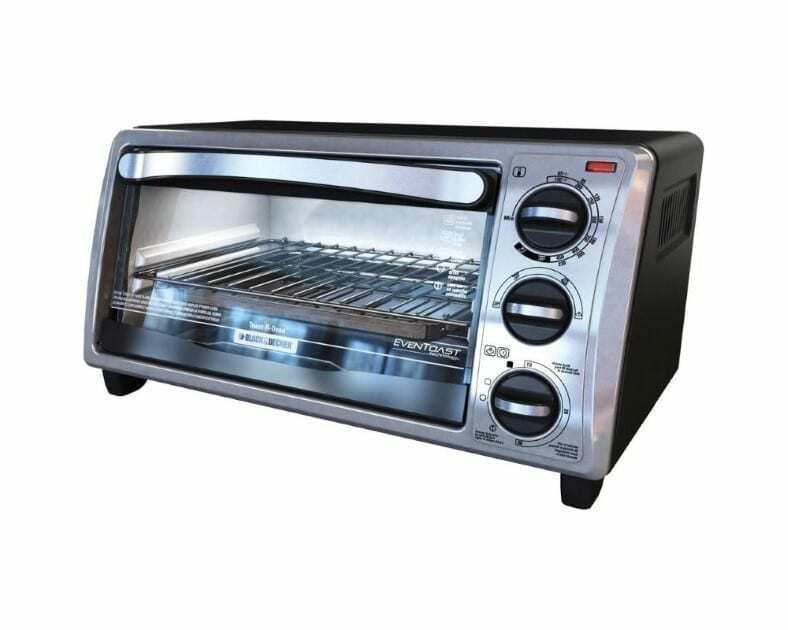 The toasting function is excellent and it’s a great low-priced toaster oven that just seems to hit all the right points where it counts. 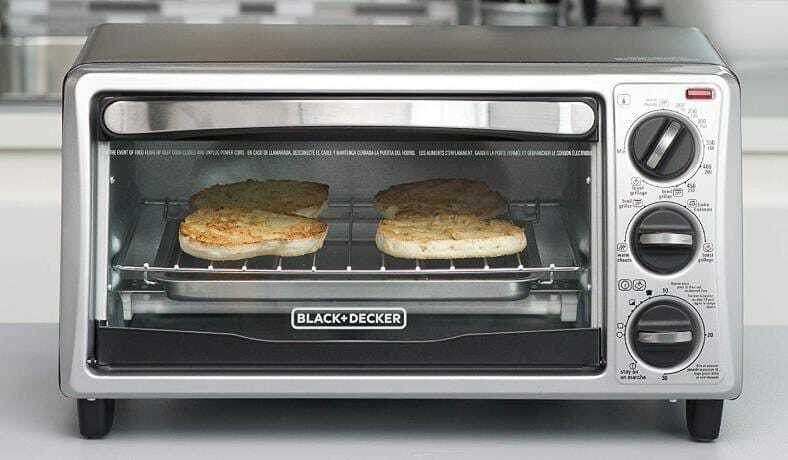 Simply-put, the Black and Decker is one of the best affordable toaster ovens I’ve found. It’s also one of the most popular among buyers, too! Because of how well it works, the quality, and the excellent value, I awarded it my Editor’s Choice rating. Don’t put with bad food any longer! Head over to find the lowest price (with free shipping!) at Amazon now. 2. 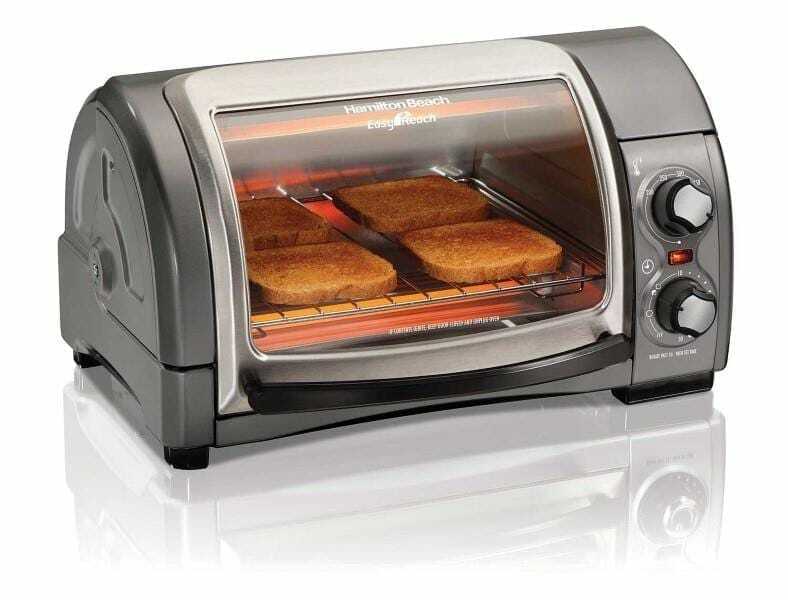 Hamilton Beach Toastation 2-Slice – Mini oven cooking power with pop-up toaster convenience. Want the convenience of a traditional toaster but the great cooking abilities of a conventional oven? Check out the wonderful Hamilton Beach Toastation 2-slice. It’s a great way to get great meals in less space – and without breaking the bank! Built into the top of the unit is a traditional-style pop-up toaster that can hold 2 slices of bread or 2 bagel halves. To keep things simple, there’s also a standard slide lever on the side to start the toasting process. It’s very compact, too. At only 9 x 17.3 x 9.3 inches in size, it’s a great for your dorm room, apartment, or shared kitchen area. 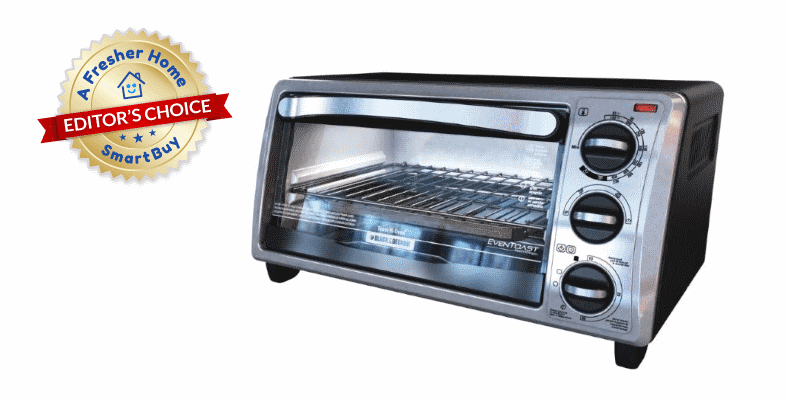 The Toastation is a great-looking and easy-to-use toaster oven you’ll love. Toasting bagels or sliced bread is a breeze! Just load the top section with 2 slices and pull the side lever down, with your toast darkness level dialed in (the top dial). Push the Cancel button at any time to interrupt the toasting process. For oven cooking, switch it to Oven mode, select any temperature up to 450 degrees, and enjoy great cooking performance. I like how simple it makes everyday toast making and cooking. Craving freshly toasted bread? You’ll get it – with toast making that’s 24% faster than leading toaster ovens. 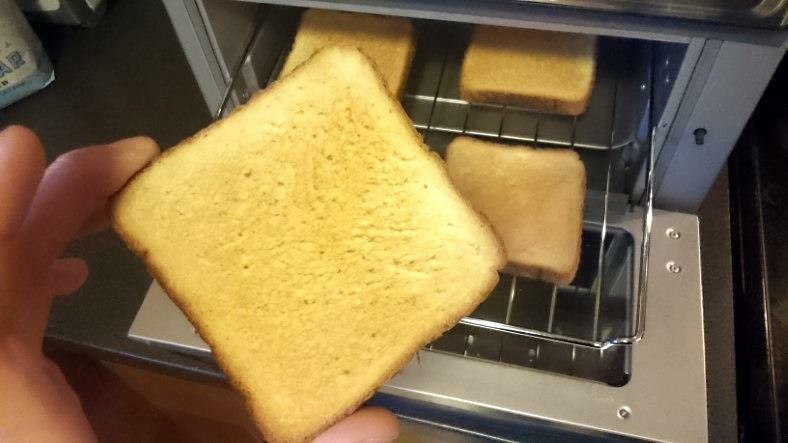 In just a few minutes your delicious, golden toasted bread will pop up – it’s as easy as that! After use, the toaster will shut off automatically (no need to worry about leaving a switch on). Preheat the oven for a little while and you’re ready to get to cooking! What really got me interested in reviewing the Toastation wasn’t just the elegant and sleek design, but how well it works for small foods. Treats like mini-pizzas cook up really nice and cruncy. What is the Toastation 2-slice toaster oven all about? Is it really worth your money? Here’s my take: it’s a really easy, reliable way to always get affordable, tasty food that helps make your student life easier. 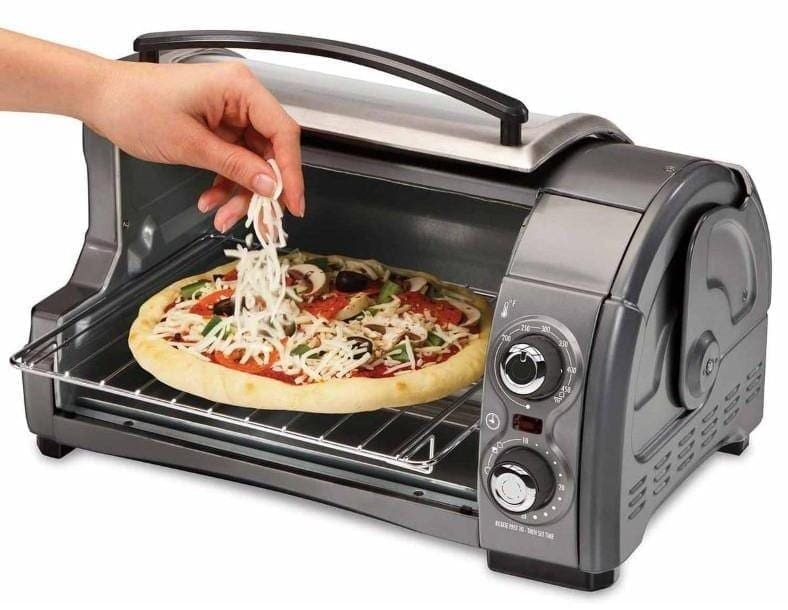 It’s not for really big items, but perfect for you and/or your roommate to cook items like small pizzas, french fries, nuggets, and many delicious budget foods. It also uses 73% less energy than a large oven! While I’ve already told you many reasons why I like it, and while it really is very compact size, (so it’s great for studio apartments and dorm rooms) there’s another reason I’m a fan. 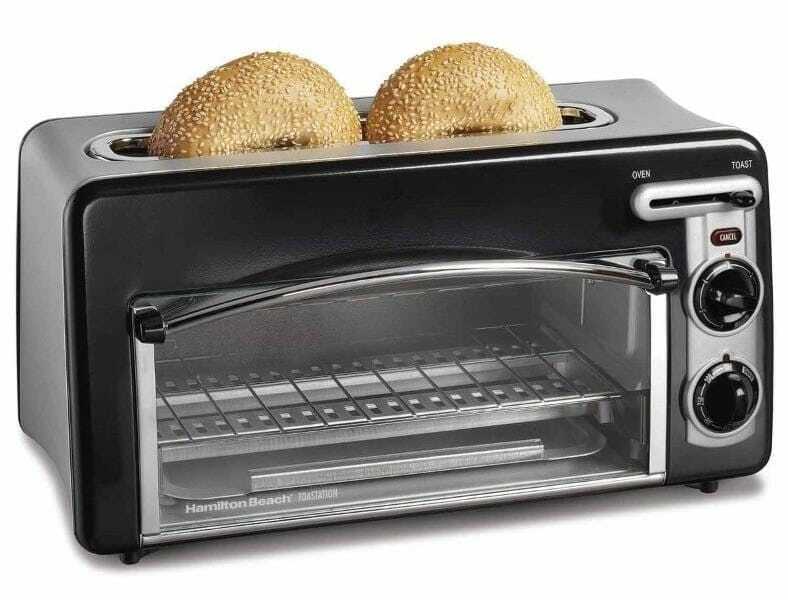 The Toastation uses as whopping 73% less energy than a large oven. That’ll put a nice dent in your electric bill every month! Over time that means the Toastation will pay for itself in savings! I remember my college days: foods like chicken nuggets, fish sticks, and even leftover pizza from my weekend job helped me survive. The Hamilton Beach can not only re-heat leftover food and cook frozen foods but also put a crisp crunch back on food that’s gone a bit soft. Frozen foods like those I mentioned above also cook 28% faster than some other models, according to Hamilton Beach. What I really like is how when the front door opens the oven rack slides out to allow easy reach of your food. It’s a pretty neat little surprise on such an affordable model. Time to clean up? No problem. Just pull out the crumb tray (found at the bottom) for wiping down with a damp soft cloth. The the baking tray is nice as well, and can hold a pretty good-sized portion including loose french fries or nuggets. What I don’t like is that it doesn’t include a feature I love and recommend: a cooking timer. However, if that’s not a priority for you, it’s a fantastic choice for some of the best toasting and the power of a compact and money-saving efficient toaster oven. I recommend the Hamilton Beach for anyone who needs a great combination countertop oven and fast toaster for their everyday college and student needs. It’s sleek, well-designed, and super easy to use choice. I really like it! Check it out today. Be sure to see the great buyer reviews and low price at Amazon now. 3. Hamilton Beach Easy Reach – Classic styling, modern value & performance, with a super-convenient roll top. With its semi-retro sleek styling and a super-convenient roll top design, the Easy Reach toaster oven really stands out from the crowd. I was really eager to get my hands on this one! There are 2 nice colors to pick from: contemporary gray or a lovely fire engine red. It’s one of the easiest to use and most convenient countertop ovens I’ve ever tested and reviewed. Wondering what makes the “roll top” design special? It’s a unique oven door that rolls back towards the rear of the oven, allowing easier access to your food. Unlike conventional toaster ovens, it can fit into even more limited spaces – fantastic for dorm rooms or any place where space is at a premium! What I love about it how it enhances your cooking experience and everyday use. For example: cooking pizza? Just roll the door back to adding toppings or check the crust. Are you a cooking perfectionist? The top makes it possible to insert a thermometer in your food or check your food without have to remove it from the oven. Very nice! Not only that, but it’s safer than other ovens, too, as there’s almost no possibility of getting burns by accidentally touching the oven interior as can happen with others. The Easy Reach really sets itself apart and makes cooking a new experience. I love the roll top design – it rolls (slides) open easily gets out of the way so you can add toppings, seasonings, sauces, and more without hassle or the risk of burns. The curved glass door window is also great as it makes seeing your food at an angle possible, too. I love how the awesome roll top makes new things possible. For example, while cooking I don’t have to remove food to check the internal temperature or to add seasoning turn over items cooking. It’s a really cool and convenient feature in my opinion. As I’ve worked with toaster ovens for some time now, I can tell you that it’s easy to have an accident and touch something hot. However, the Easy Reach greatly reduces the risk of burns as you’re far less likely to touch hot metal. Top: Don’t worry, although the roll top door is unique, it’s easy to remove and wash! Bottom: Done toasting or cooking? Slide out the crumb tray and just wipe it down. Very simple and hassle-free. The Easy Reach is one of the easiest to clean toaster ovens I’ve dealt with so far. While you might be guessing that the rolling door design makes cleanup, it isn’t the case at all. In fact, it’s actually pretty easy to do. The door is removable for easy hand washing. As with other products, there’s a nice crumb tray which catches crumbs or drips from cooking food. Slide it out for easy clean up and you’re done in jiffy. The cooking timer dial includes selectable toast darkness levels. Place up to 2 slices of bread on the oven rack in the top tray position for optimal toasting both on the top and bottom of your bread. For items such as bagels and English muffins or waffles, place the rack on the lower position. The toast function works well and my test items (bread, bagels, and a waffle) turned out well: evenly crisped and delicious. …and that’s it. When the cooking timer ends the Easy Reach will switch off automatically and your food is ready and waiting. It’s very simple, although it’s not as powerful as other toaster ovens in the same (budget, under $50) price range. If you’re planning on cooking larger items like 1/4 chickens or steaks, you’ll need to allow more cooking time. 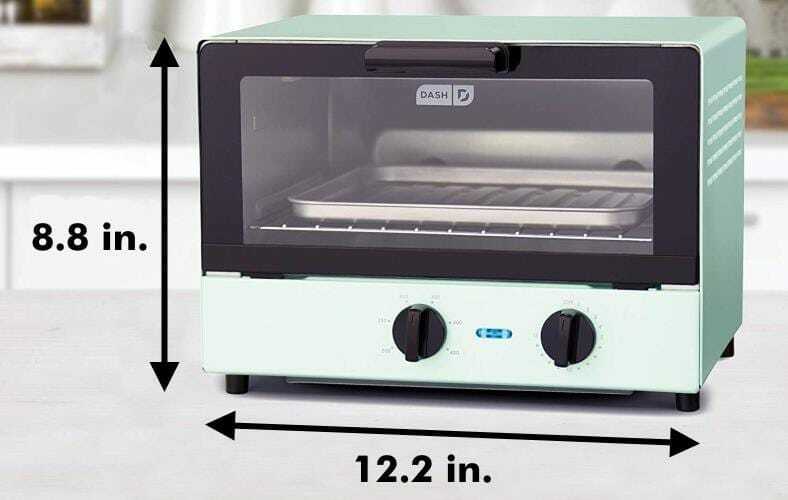 Overall I found it to be a great little oven that a good performer for its size. The owner’s manual, although a bit simple, is very clear and does help you get started easily. Although it’s not perfect, I’m impressed with how well it works and especially how convenient it is to use. I can’t get over how much easier it makes accessing food while cooking. I also really like the “retro-ish” styling and the lovely red color. It’s a nice touch you simply won’t find on others. Have a look now and it's one of the best-selling and highest rated budget toaster ovens at Amazon. 4. Dash Compact Toaster Oven – Restaurant style looks and modern cooking features on a budget. Want something that offers modern styling and performance but won’t break the bank? Here’s a great one! The Dash Compact toaster oven shows that when smart design meets modern styling great things can happen. Even though it sells for under $50, you wouldn’t guess it. To me in person it looks more expensive that it really is and is reminiscent of a professional restaurant kitchen oven. It’s that nice. Baking, toasting, and other tasks are a breeze. Simply set the temperature and then the timer – then let the dash do the rest. The power light will stay on while it’s working and as the timer ends the power will shut off automatically. As the timer runs out and the oven turns off you’ll hear a chime sound. Small but powerful! Thanks to the smart design, the Dash Compact measures only 8.8 x 12.2 inches in size. The bottom-located controls help it take up less horizontal countertop space. 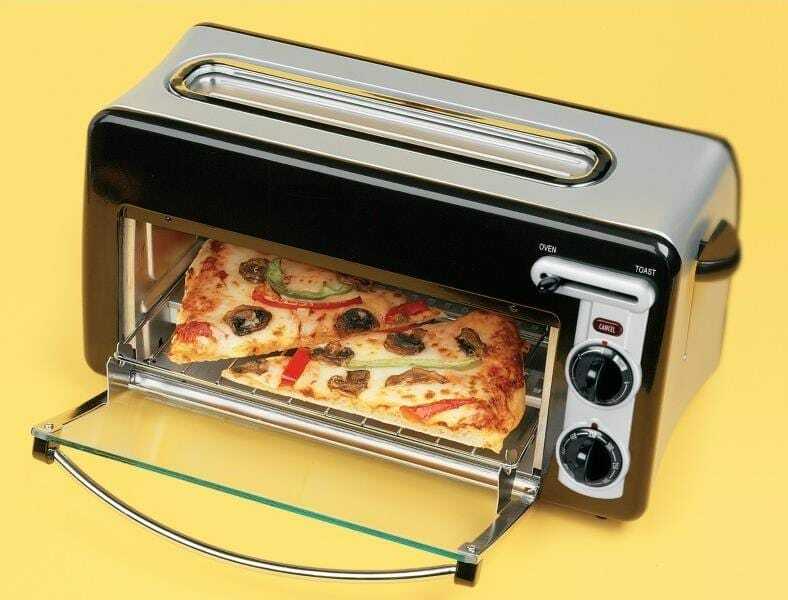 It’s a refreshing approach to toaster ovens. The Compact is an excellent fit for dorm rooms, a common (shared) kitchen, and so much more. What I really like about it is how the design has the controls on the bottom and not the side like others. This results in less horizontal counter space being taken up. It also helps give it the unique look it has, too. Top: A slide-out crumb catcher tray is located at the bottom of the unit for easy clean-up after use. Bottom: How cool is that? The owner’s manual is not only clear, helpful, and well-written, but also includes some really nice recipes to get the most out of your new oven. 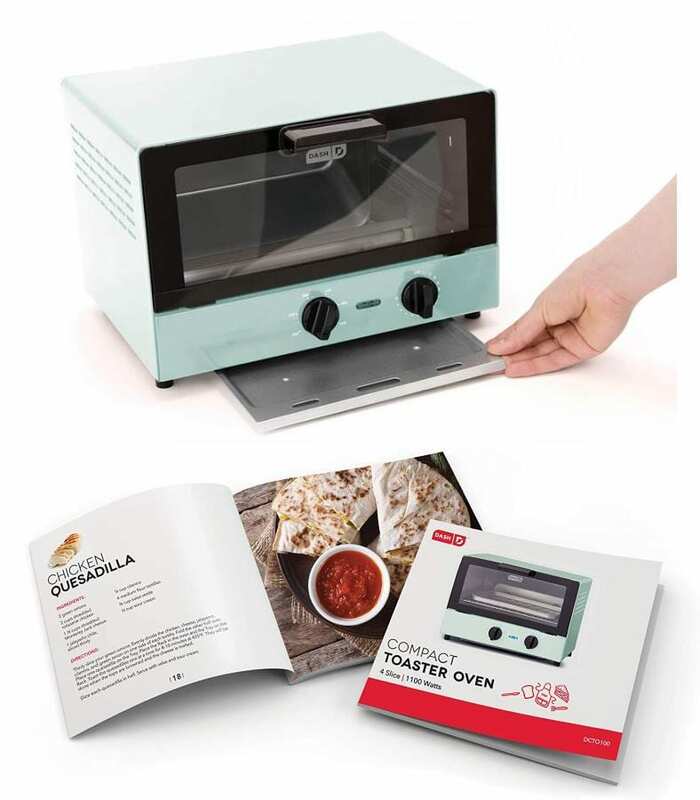 In addition to the oven tray and backing pan, the unit also includes a convenient crumb tray (which slides into the bottom) that makes clean up a snap. Need to pull out the oven rack? That’s no problem, as it’s easily removed, too. I have to say I was impressed with the owner’s manual. It’s clear, very helpful for getting started, and includes some excellent recipes I’m sure you’ll enjoy. Like other ovens in its power range, warm-up (preheat) time is fast, too, taking only 3-5 minutes to preheat before you’re ready to cook. In my test the Dash Compact cooks well and is a great performer. My one and only real complaint is that there’s no toast darkness settings provided. If you’re not big on toast, that’s not really an issue, but it’s something to be aware of beforehand. 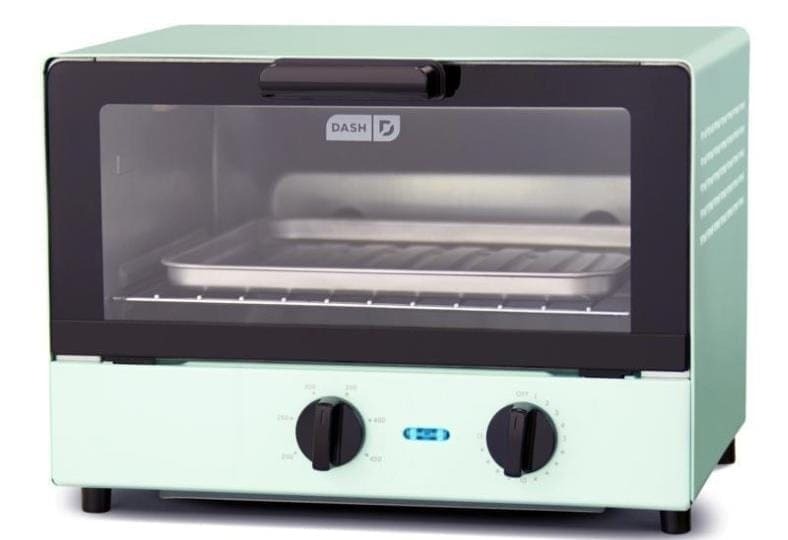 If you need a general purpose, great-looking, and modern toaster oven, the Dash Compact is well worth checking out. While I wish it offered a few more features (toast darkness settings, and a 30 minute timer instead of 15), it’s designed mainly for general compact oven cooking. It does it well! Be sure to find out why it's a hidden gem and see the great buyer reviews at Amazon. 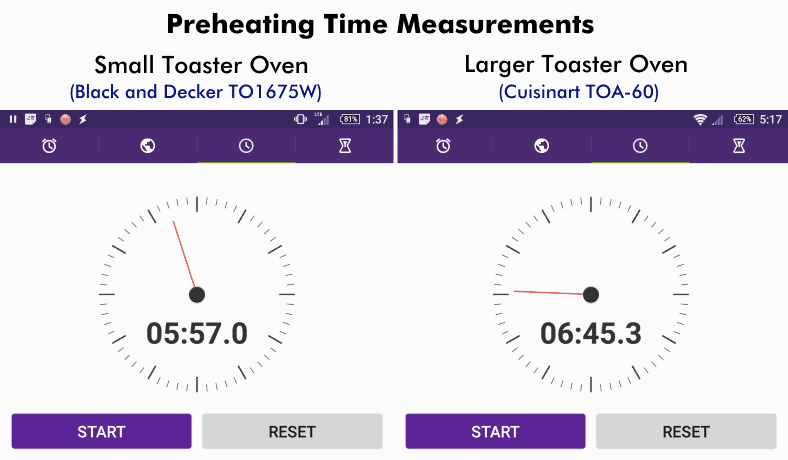 Want to learn more about toaster oven preheat and cooking times? 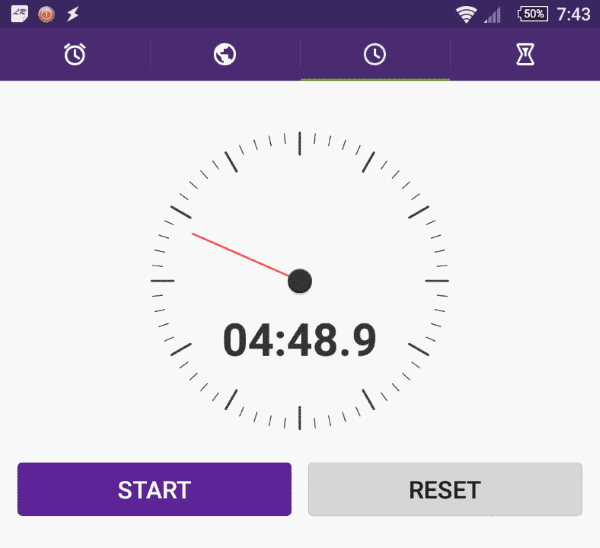 Check out this helpful post where I measured oven preheat time.